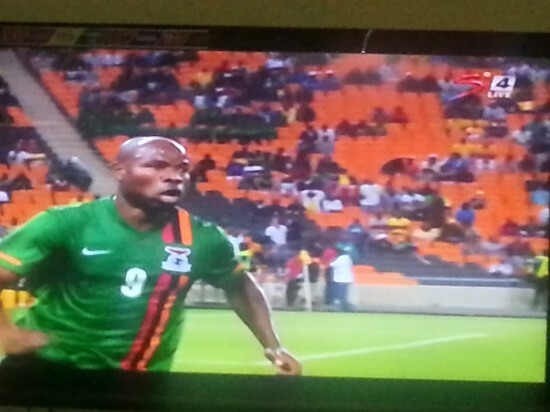 A cracking strike by Collins Mbesuma gave African reigning champions Zambia a deserved win to take home the Nelson Mandela Challenge at the Soccer City on Wednesday night. The Orlando Pirates marksman, who has been on song for his club, came off the bench to separate the two teams who showed all the signs of being goal shy before beating Bafana keeper Itumeleng Khune hands down in the 64th minute. Organised at the back and watertight in midfield, Chipolopolo showed why they won the Africa Cup of Nations in style as they followed coach Herve Renard instructions of closing down Bafana as quickly as possible from start to finish. Having promised the nation that a win will be dedicated to his assistant coach the late Thomas Madigage, who could have turned 42 years in a night when all eyes were on Madiba, Gordon Igesund’s boys were tactically exposed. Starting the game brightly, with Bernard Parker ferocious shot going inches wide as he was left unmarked, all signs of handing Igesund his third victory in five matches were on track in the seventh minute. But it didn’t take Zambia long to showcase why they are the kings of the continent when former Pirates playmaker Isaac Chansa did well to dispose Dean Furman in the middle of the park but his shot went straight to the hands of the agile Khune five minutes later. Even when the dangerous Emmanuel Mayuka was brought down by Sifiso Myeni at the edge of the penalty area with his shot going just wide of Khune’s goal, Bafana were in total control of the game. With the first half being toothless in front of goals, it was expected that both teams will return from the break in a goal scoring mood. And while Bafana were still trying to find their rhythm, it was Zambia who accelerated more fluidity and power into their play with Mbesuma giving Igesund early warning signs that more work still need to be done if his Bafana side are to reach the semifinal of the Africa Cup of Nations with less than 64 days to go.